Despite the name, Santa’s Little Helpers and the Ice Cube Jam is not a rap group that only does Christmas songs. No! It’s a cute, holiday-themed game, appropriate for all ages. You are an elf, one of “Santa’s Little Helpers”. You are collecting sets of blue, green, and clear “ice cubes” that Santa uses to make jam. The first player to deliver 3 complete sets (2 sets for 5-6 players), wins! 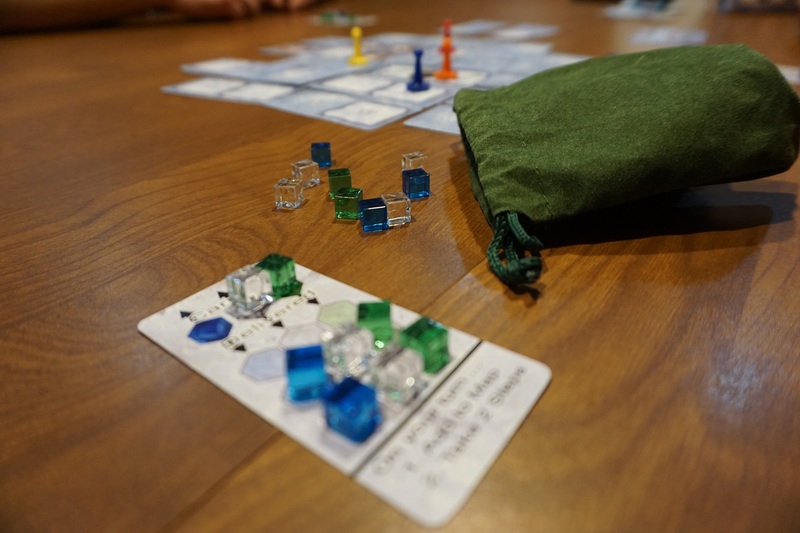 Ice Cube Jam is billed as a short, quick-to-learn game that is fun and engaging for everyone. The point may be to deliver supplies for jam, but does Ice Cube Jam deliver on fun? Let’s take a look! 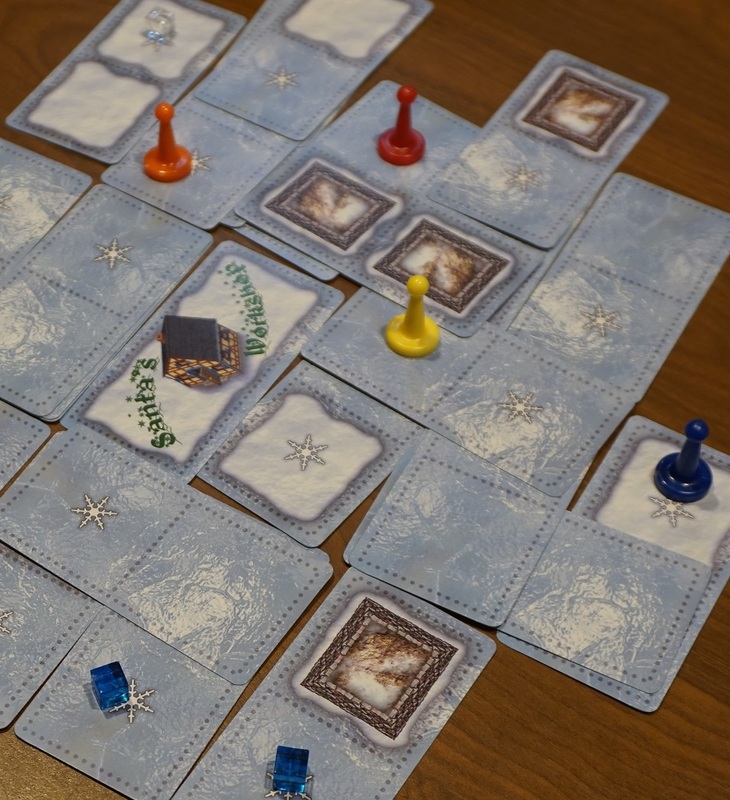 In Ice Cube Jam, the playing field is made of “domino” cards that contain two spaces, each of which may be snow, ice, or impassable walls. Some spaces also contain a marking for an ice cube, which is drawn randomly from a bag. Each turn you may add a card to the field, move your pawn up to 2 spaces, or both. You pick up ice cubes as you move, but you can only hold one of each color (green, blue, clear) at a time. 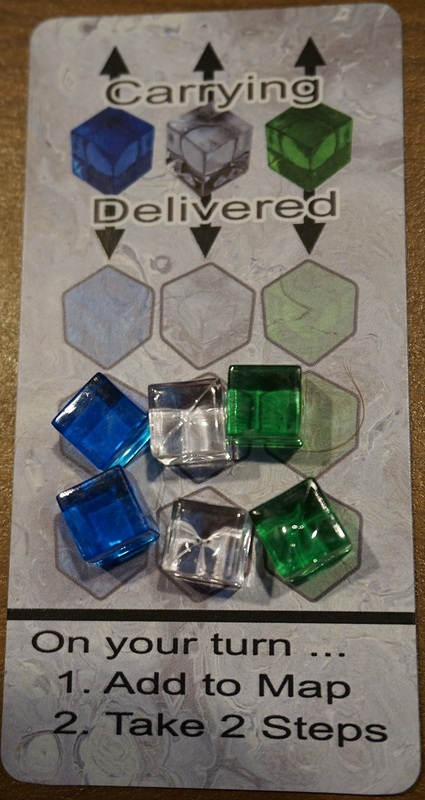 Once you have a full set, you head back to “Santa’s Workshop” in the middle of the board to deliver the cubes and start another run. A card can be added anywhere that touches an existing card, including placing it on top of existing cards. Thus, you can change the map significantly, not just on the edges. Block your competitors with a wall, or put down a space containing a new ice cube to help you meet your goal. Your pawn can take up to two steps on your turn. However, you may also choose to slide if your step takes you onto the ice. Sliding means continuing along the ice in the direction of the step until you hit something – snow, a wall, another pawn, or the edge of the board. You can pick up any ice cubes you slide past, as long as you have room for them in your backpack! Race your friends to the ice cubes. Block a “planned slide” with some inconvenient snow right in the middle, or put extra ice down to help you slide all the way to victory. I liked this game a lot. It’s a cute theme, fast to learn, and fast to play (15-20 minutes). It works well with any number of players, and just about any age (a non-reading child could play as long as they have the ability to sit and pay attention for 10 minutes). Best of all, there is real strategy involved, enough to keep the experienced gamers busy, but no one ever pulled ahead and remained un-catchable. In fact, most of our games ended with multiple people having collected their final set of cubes and racing to see who could get back to Santa’s Workshop first. Santa’s Little Helpers and the Ice Cube Jam would make an excellent stocking stuffer for anyone who likes board games – whether they are 4 years old or 84. I know our family will still be playing it long after Christmas has passed. You can pick up a few copies to give away yourself at The Game Crafter. At just $14.99, it makes a great gift for anyone! The Family Gamers received a review copy of Santa’s Little Helpers and the Ice Cube Jam. Sounds like fun!! But the again, I love board games. Hey… I have a suggestion for a game to review, if you haven’t done this one already. Maybe you could do a review of Troke and revive the game? I may review Troke at some point, but yeah, it’s been out of print for 30 years, so I’m not sure I want to recommend it to people when it’s tough to buy. Mostly we’re trying to review new games, especially from individuals or small publishers. Bahahahahaha. What a good follower I am not. So I researched Troke on google, found a review of Troke on boardgamegeek.com, which cross linked FamilyGamers and BAM! You’ve already done Troke. Silly me. Congrats on being linked to boardgamegeek.com though. They seem huge, right?